In the mid 1980s, this Kraft Nabisco cheese and crackers snack was one of my most favorites. There was something cool about the two different compartments. I loved unwrapping the plastic and revealing four or five rectangular crackers, a red plastic spreader and applying the cheese myself to each cracker. The cheese, often soft and somewhat melted from my brown bagged lunch which sat in my desk for several hours prior to lunch time. It's funny, to this day I gauge how long a non-refrigerated sandwich will remain safely edible based upon my grammar school brown bagged lunch days. Seriously. I honestly do this, it's like my "grammar school bagged lunch" theory. Example, bringing a sandwich without a cooler on a road trip or leftovers back to a hotel room without a fridge, etc. Crazy, right? Today, Kraft Nabisco has an entire line of Handi-Snacks featuring more modern day dipping options such as Bread Sticks 'n Cheez, Oreo Sticks 'N Creme and Honey Maid Grahams 'N Apple Dip. I wonder if they purposefully spell cream as "creme" and cheese as "cheez" because it's processed and fake? Anyone know? I mean, if the rationale was for the cuteness factor, wouldn't Nabisco spell sticks as "stix"? Handi-Snacks, in my opinion, paved the way for Lunchables, also by Kraft. Think about it. Empowering kids to fix their own processed food lunches from cute sectioned-out plastic trays? I lovveedddd these as a kid. Still do, in fact - I'll see them at the grocery store and buy them every once in a blue moon. Lunchables were also the bomb, although it was important to get the turkey ones. Also, Lunchables ALWAYS came with way too much cheese. The Capri Suns were awesome though. My grandkids couldn't make it, without lunchables. I'm not too fond of them. Just give me a PBJ! Yeh these are pretty great. They took you TIME to put the cheese on the cracker so the snacking experience lasted longer. For some reason that was really satifying. But 'Lunchables' are just another way 'The Man' tries to get you to conform to his cookie cutter world and learn to accept the arbitrary spaces he leaves you for your food. Everything in it's place. No room for nothing but what 'The Man' wants you to have. That may be fine for you but he won't get me to play along, sister. cal, i was being somewhat sarcastic, however i do love the name "lunchables" so very cute. kudos to that copywriter. So was I Ally, I always am looking for something to blame 'The Man' for and this just seemed like something he would do to entrap us early. I used to love the ones with like the Pizza flavour cheese. That was awesome. I always read your blog just before dinner, and you often remind me of some yummy snack. I never had them much as a kid. Lunchables were always a surprise. Loved Cheese and Crackers as a kid. I used to eat all the crackers dry then shove the whole cheese globule in my mouth. Delish! BTW..As a person who used to work on the Kraft account (writing coupons oooh) I can personally attest the success of Lunchables, or as I like to call 'em, crack for kids. I cant deny I love those handi snacks. Got me thru the day while I was in school. I definitely loved the bread sticks and cheese and lunchables was my favorite to take with me. Esp on those field trip days. Yep, I remember those well! We used to pack all the variations on that for The Daughter for her lunch when she was younger, and I would often steal them for my own lunch! Oh my god! I had these in my lunch almost every day. Is there anything better "cheese" and crackers packaged together?! Hello. Thank you for following me via FF. I am now following you too. I am sorry it took me so long to return the follow. I went to camp this weekend and don't do much blogging there. Yes, I remember these well. The little red plastic stick to spread the cheese. Had not thought about them in a while. Oh man, I absolutely loved these! Honestly, I could just skip the crackers and go straight for the plastic red stick dipped in cheese. Even though I didn't really enjoy these, I still insisted that my mom buy them because of the novelty. I love those! I have the long stick ones in my cabinet right now. hey. i loved these when i was a kid. and ok fine. i still love them. processed cheese and fragile crackers rock! Our kids grew up, and I haven't had one since! I always made a point as threading as thin a layer of cheese on the crackers as possible, so I would have plenty of cheese to eat with the red spreader. The cheese was definitely my favorite part. Okay, that should be "made a point OF SPREADING" not "as threading". Those were my FAVORITE. For years I had them in my lunch every day. 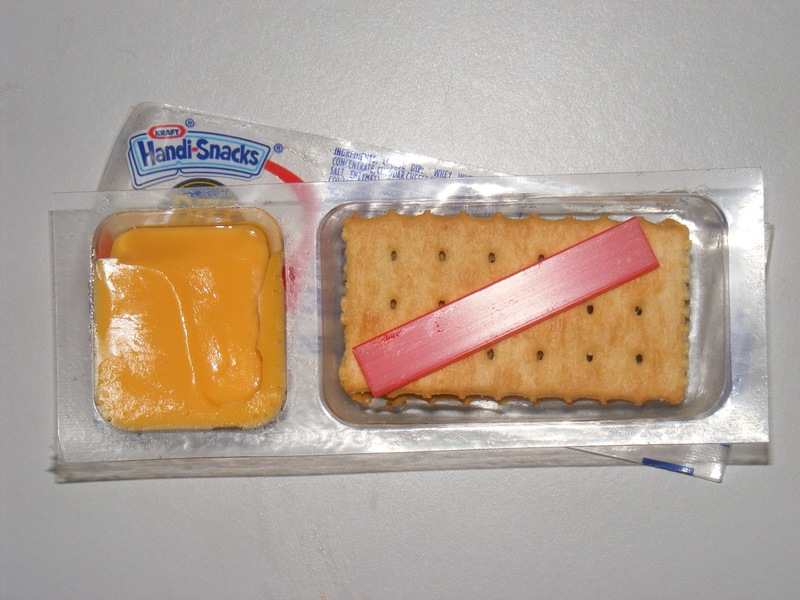 I never would spread the cheese on the crackers though...I'd eat the crackers first and then eat all the cheese by itself with the little red stick. I'm pretty sure the creme and cheez spelling is because it's fake/processed. I know things that have choc in the name is not just an abbreviation - it's because it's not actually chocolate. ie. choc biscuits as opposed to chocolate biscuits. OH yeah! Nothing natural in that cheese at all! Loved these things! Oh the processed foods. My mom/babysitter yelled at me the other day because my son told her that I wouldn't let them eat lunchables any more. She had just bought a ton for the kids. I told her if they eat it once in a while fine, but I don't want them eating them every day. I never really paid close enough attention to the labels until I read something about how bad they were. I don't even like them anyways! I will treat my kids to them every once in a while though. I only had this a few times and can't even remember if I liked it or not. We did brown bag lunches all the time for school. I loved those as a kid. And I do the same thought test about how long something can stay good. I PUFFY HEART THOSE THINGS! Also, the bread stick ones are awesome too. *shudders* I did not like the cheese in these things. It was too cheesy? Melty? Kinda made me sick after awhile. I had a weird thing with cheese in plastic, like the kraft singles and these Handi-snacks. I of course had no problem whatsoever with Taco Bell's nacho cheese...still the best! this was such a treat back then -- we still buy these occasionally - only the generic brand now- classy! I still eat these whenever I get a chance. Ever eat the ones that have cookie and marshmallow? Hard to find but delicious! when I was a kid this was THEEE snack to have in your Return of the Jedi lunchbox. Unfortunately my mom thought that we should eat healthy nutritionally balanced lunches in which plastic cheese product played no part. I think we got them as a treat once and a while. Like if our birthdays were on a school day. Sigh. mmmmm...handi-snacks. We rarely got these because I am the oldest of 5 and then became 9 in 1999 so...that many kids cost lots of money!! Limited snacks for us and we only got ONE soda a WEEK.